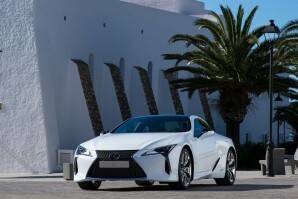 Lexus has long realised that it needs to do something different if it's to effectively take on the premium German brands. Well, that's certainly what's it's done with this car, the LC Coupe. It's come equipped to take on the luxury coupe segment's very top contenders, with drive dynamics that work on the track as well as on the highway. Plus there's styling that'll cause a stir in the High Street, a gorgeous cabin and hi-tech hybrid power if you want it.